With a superb location, the apartment is set on a hillside in the Praia da Oura, 130 meters from the beach, 150 meters from the famous �strip� (Night life with a lot of Bars and Restaurants), 4 km from the center of Albufeira (touristic capital of the Algarve) and 300 m from the resort centre, where a good selection of shops, bars and restaurants can be enjoyed. 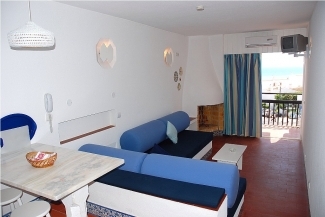 The apartment with personalized and Mediterranean style, was renewed in 2010, is facing South, with full or partial Sea View, and has individual beds in the rooms. The living room has individual beds or sofa beds. The Apartment has AC, Balcony or Terrace, Satellite TV, fully equipped Kitchenette, Safe (to be paid for) and Laundry Service or Self- laundry in the building. You can even ask for Babysitting, Room- Service, Direct Telephone, Car Rental, Excursions and Cruises, Paintball, Training, Trails, Fax, Email, Photocopy and an Internet Kiosk in the building. 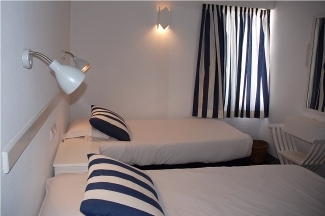 The apartment is located in Albufeira in the center of the Algarve. Within 8 km there are golf courses, tennis, squash, courts riding, centers recreation, marina, beautiful beaches, aquatic parks, nautical sports, health clubs and gymnasiums, monuments casino, airfield, the fantastic Albufeira night life. Faro capital of the region and important historical center is 30 km far.